The Madagascar Marsh Harrier (Circus macrosceles) is a bird of prey belonging to the marsh harrier group of harriers. It inhabits Madagascar and the Comoro Islands in the Indian Ocean. It was formerly regarded as a subspecies of the Réunion Harrier (C. maillardi) but is increasingly treated as a separate species. 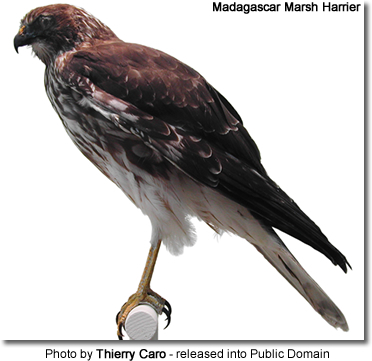 It is also known as the Madagascar Harrier, Malagasy Harrier or Malagasy Marsh Harrier. It is about 59 cm long; the female is up to 13% larger than the male. The male has a blackish back and a greyer head with dark streaks. The underparts and rump are whitish and the tail is grey with dark bars. The forewings and wingtips are blackish while the secondaries (shorter, upper "arm" feathers) are grey with dark bars. Females are browner than the males. The Réunion Harrier is smaller and darker with shorter legs and shorter, more rounded wings. Males have a blacker head and plainer secondaries (shorter, upper "arm" feathers) and tail. It feeds mainly on birds such as the Madagascar Partridge and also takes reptiles, amphibians, rodents and insects. It typically feeds by flying low over the ground and dropping down rapidly when it spots its prey. It will also hunt over the canopy of forests.